Steven Gerrard's long-range goal against West Ham United in 2006 has come top in a vote to find the best FA Cup final goal from the last 50 years. Ahead of Saturday's Wembley showdown between Arsenal and Aston Villa, which will be shown live on the BBC, we wanted you to let us know which is your favourite final goal. And you voted Gerrard's strike ahead of Ricky Villa's famous finish for Tottenham against Manchester City in 1981. Third was Roberto Di Matteo's goal for Chelsea against Middlesbrough in 1997. Find out how you voted and watch all 10 goals below (UK only). The only free-kick in the top 10, and it came after a foul that is perhaps as famous as the goal itself. Tottenham's Paul Gascoigne brought down Gary Charles, causing damage to his own knee ligaments that would keep him out of the game for almost a year. Left-back Pearce stepped up to thunder a left-foot rocket past Erik Thorstvedt into the top corner, but Spurs went on to win 2-1 with Des Walker scoring an extra-time own goal. This winning goal was half of a memorable brace from Owen in the first FA Cup final at Cardiff's Millennium Stadium while Wembley was being rebuilt. The Gunners led 1-0 through Freddie Ljungberg but 21-year-old England striker Owen equalised with seven minutes left with an acrobatic finish. And in the 88th minute he entered FA Cup folklore as he chased a Patrik Berger long ball, beat Lee Dixon and Tony Adams and fired a left-footed finish into the bottom corner. The England Under-21 midfielder was only a teenager when he scored one of the defining goals of his career. After Spurs failed to clear a free-kick, Tommy Hutchison headed the ball across to MacKenzie, who hit a spectacular first-time volley from outside the box to make it 1-1 in the replay at Wembley. "One of the tragedies of Ricky Villa's winner was Steve MacKenzie's goal," Micky Hazard, who was at Spurs at the time, told BBC Radio 5 live. "It was a great goal but it got lost and hardly got a mention." * Although MacKenzie and Owen polled the same percentage of votes, Owen received more votes. The Middlesbrough-born forward scored the only header on our list - and what a header it was. With the Sky Blues losing 2-1, Dave Bennett's perfect cross was met by a Houchen diving header to steer the ball past Ray Clemence and send the game into extra time. Gary Mabbutt - who had earlier scored in the right net - later put the ball past his own keeper as Coventry won the only major trophy in their history. The long-haired midfielder scored an extra-time winner as Arsenal wrapped up a league and cup Double with a 2-1 victory. After a goalless 90 minutes, Liverpool led through Steve Heighway but Eddie Kelly levelled things up. With nine minutes remaining, a visibly drained George smashed a superb 20-yard shot past Liverpool keeper Ray Clemence before collapsing to the ground with his arms outstretched in celebration. The England midfielder had not scored in the Premier League all season so Chelsea could have been excused for not worrying too much about his run forward. Sylvain Wiltord played the ball to Parlour 45 yards out and as he ran towards goal, the Blues defence backed off, only to see the 'Romford Pele' curl home past Carlo Cudicini from 25 yards. Ljungberg then scored in his second final in a row as the Gunners won 2-0 to secure the Double. The Northern Ireland prodigy scored his second FA Cup final goal at the age of only 20 - and it proved to be the winner. United were down to 10 men after Kevin Moran's red card against holders and favourites Everton. In extra time, Whiteside dribbled in off the right flank before performing a step-over and curling a perfect arcing shot around defender Pat van den Hauwe, past Neville Southall and into the far corner for the only goal of the game. The fastest goal in an FA Cup final at the time. Middlesbrough kicked off but Italy international Di Matteo picked up the ball in his own half 35 seconds into the game. Seven seconds later it was in the back of the net via a 30-yard strike which flew in off the crossbar. Chelsea went on to win 2-0 for their first major trophy in 27 years. Louis Saha scored an even quicker goal for Everton against the Stamford Bridge club in 2009. After Steve MacKenzie's stunning volley, Kevin Reeves gave City the lead - but Garth Crooks made it 2-2. And what followed was one of the FA Cup's iconic moments. Ricky Villa, who had scored the opening goal, dribbled brilliantly through the City defence and turned the ball past onrushing keeper Joe Corrigan to make it 3-2 and win the FA Cup. "I remember getting the ball and my first instinct was to attack," Villa told BBC Radio 5 live. "As soon as I ran towards the goal I forgot about everyone around me. "I lost control of the ball just a little before the goal but I shot. Sometimes you need a little luck and this is what happened. "It changed my life in the English league." The most recent goal on this list came in arguably the greatest FA Cup final of all time. With the Hammers winning 3-2 entering injury time, a header clear dropped to Gerrard who, despite hobbling with cramp, thumped a first-time shot from 35 yards past Shaka Hislop into the bottom corner. The Reds won on penalties, with Gerrard successfully converting his spot-kick. West Ham goalkeeper Hislop recalled: "You don't expect him to hit it from that distance if he is carrying an injury. But he hit it first time and I don't think he could have hit it any better. "He absolutely smashed this half-volley. I saw him coming onto it but there were a lot of players between him and me and he hit it so well it was in the back of the net almost before I could react. "I have watched the FA Cup since I was a little boy and I can't think of a goal that was better than that or one that was more meaningful." 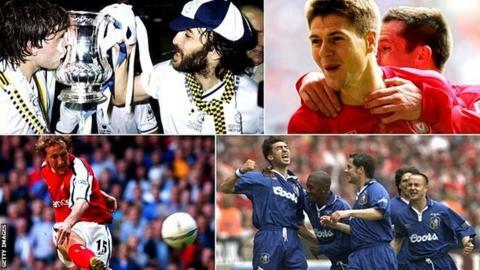 Listen to BBC Radio 5 live's podcast on the top 10 FA Cup final goals of the last 50 years.